Home Sponsored Content B-Seed Investments – Your bridge to Israeli startups. B-Seed Investments – Your bridge to Israeli startups. At some time or other, we have all wanted to travel into the future, to see what lies ahead. While time-travel is still the subject of science fiction novels, there are several new and promising Israeli startups that hopefully will give you a glimpse of the technology that is now becoming a reality. No seed grows without water and air, the same goes for the startup nation. 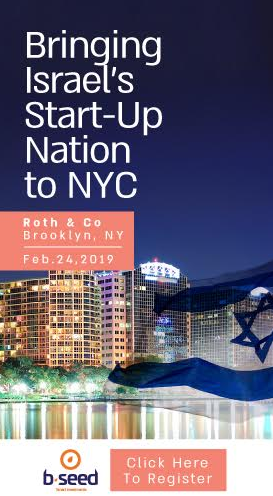 We build the connections between the US investment community, who is looking for unique investment opportunities and early stage innovative Israeli startups. Our startups hold the promise of delivering some of the most cutting-edge technologies, which have a great potential to hack their way into their respective markets. The circle of supporters, both young and experienced, is still growing and that’s what we are promoting in this venue today. The future is out there, but its’ foundations are laid here! Feb.24,2019 / 12pm-4pm. Roth & Co, 1428 36th Street, Brooklyn, New York. Swathly: Provides data-driven products and services to identify growth and cost-saving opportunities for the manufacturing industry. Class.Me: A mobile platform that fits in every student’s pocket. It has it’s own communication service, a social learning center and even a virtual classroom. Fertigo: Developing a device designed to multiply the success rates of in-vitro fertilization (IVF). The device monitors the uterus and predicts the optimal timing for embryo implntation. Verto: The easiest way to generate any 3d model by any camera. Enerjoy: An AI based platform, that utilizes insights and knowledge from behavioral science in order to generate sales and revenues and shows increase of around 29% in KPIs. Innovesta: An AI based platform for investors to make better investment decisions. Innovesta automatically curates relevant knowledge holders around the world in a structured validation process, combining objective data and the human element as never seen before. MyTower: Provides IoT management tools to enable a more efficient communication and services in connected residential buildings. MTTech: Develops and sells full solutions of interactive multimedia systems which combine hardware, software, the Internet of Things, and artificial intelligence for a variety of functional, efficient and fun uses (kitchen, office and more).